Label Print Technologies, LLC (“LPT”) is a vertically integrated flexographic converter of pressure sensitive labels. The primary markets served include food processing, manufacturing, distribution, and service segments of the food industry. 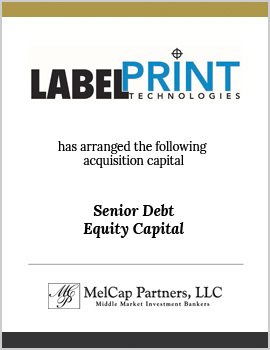 MelCap Partners acted as the acquisition advisor to LPT. Principals of MelCap Partners, acting in the capacity of registered agents of M&A Securities Group, Inc., successfully represented LPT in the acquisition and in arranging the requisite debt and equity capital.